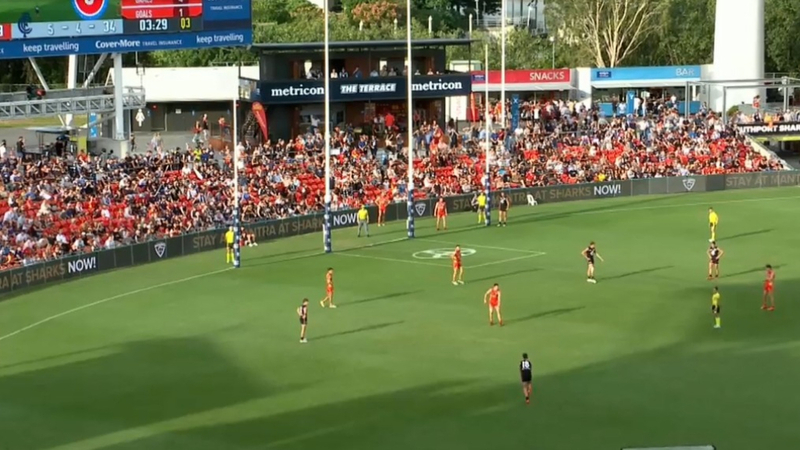 Jack Bowes' last-minute snap has pinched victory for the Gold Coast and cruelly kept Carlton winless in a scrappy Sunday comeback at Metricon Stadium. Bowes emerged from the pack to sneak a 15m effort over the last man, with the ball rolling through with 13 seconds on the clock to continue their golden start to the season and break Blues' hearts. "We've had four close games this year. The boys have been so gutsy, showed a lot of resilience," Bowes told Fox Sports after the win. "We tried in the lead up in that last quarter, we tried to stay composed, rip it in, that's what led to the goal." It continued the Suns' theme this season, with all four game margins within five points. Peter Wright thought he had spoiled it for his side, awkwardly fumbling a mark over the line that would've been a goal had he left it.